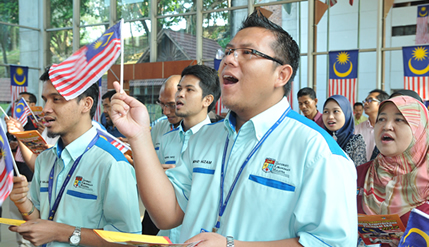 BANGI, 1 Aug 2012 – Staff of The National University of Malaysia (UKM) were reminded to be vigilant towards those who may abuse the autonomy the university currently enjoys. 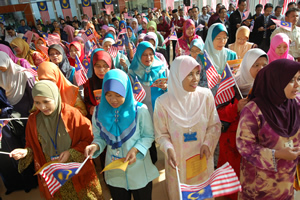 Vice Chancellor Prof Tan Sri Dato’ Wira Dr Sharifah Hapsah Syed Hasan Shahabudin said the priviliege should not be taken for granted and must be upheld just as the nation defended its independence for the last 55 years. Prof Sharifah Hapsah launching the 2012 Merdeka Month celebrations for UKM at the Chancellory Building foyer here this morning said the university community needed to defend its autonomy by being responsible and logical when making certain demand or claims. Students and the academics do have the right to free speech but whatever claims made must be responsible and backed up with evidence, are logical and not devoid of common sense. She said absolute freedom does not exist in any institution anywhere in the World, even in the United States of America. It does not make sense to assume that universities in the West have unlimited freedom. Even leaders of universities in America were emphatic that academic and student freedoms have their limits in order to uphold the integrity and credibility of the institution. She congratulated the university community for their preseverence in meeting various challenges in the course of their duties and organising the 2012 Merdeka Month celebrations at the UKM level. At the launch, Prof Sharifah Hapsah distributed the Jalur Gemilang flags to seven representatives from the faculties, institutes, services, students, reserve officers’ training unit (PALAPES), volunteer police (SUKSIS) and residential colleges. Prof Sharifah Hapsah, as Honorary Colonel of the UKM ROTU received the flypast to the accompaniment of music. Several programmes will follow throughout the month for the independence celebration with this year’s theme “Promises Made Good”. Celebrations of the month began with singing of the national anthem and patriotic songs as well as a poetry recitation by Dr Zubair Idris, a lecturer at the School of Malay Language, Literature & Culture, Faculty of Social Sciences & Humanities. The song “Warisan” was sung by the runners-up of a recent campus talent show, Azwan Daud. 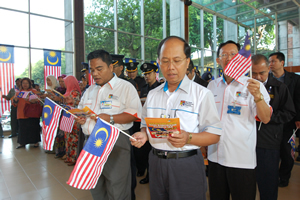 Deputy Vice-Chancellor (Student Affairs and Alumni) and Chairman of the Reception Committee, Prof Ir Dr Othman A. Karim, and other deputy vice-chancellors, deans and senior faculty members of the University attended the launching with Prof Othman unfurling the Malaysian flag at the ceremony.